Ein langjähriger Musiker mit klassischer Rock-Sozialisation aus Salzburg macht spontane Musik, um zu ihrer Magie zurückzukommen. Aus dem Doppelalbum "The Flower of Life". Konzeptalbum zum Thema 2012. Eingespielt 2010. Gesang und Klavier: Heinke Aussenegg, Ute Lang, Cello: Monika Gaggia. Ich wurde 1968 in Salzburg geboren und bin auch dort aufgewachsen. Habe Musik und Malerei früh als Artikulationsformen bevorzugt. Gehört: Klassik, Beatles (mit 10 ;) ) Pink Floyd, Led Zeppelin, Talk Talk, Richard Strange etc. Talking Heads, David Bowie, Red Hot Chili Peppers-bis Heute das volle Programm halt. Music is music Is music...Musischer Zweig im Oberstufenrealgymnasium,Klavierunterricht, Schulband, blablabla. Tontechnik studiert, viel gemacht, eh toll. Aber ab 2004 wieder ein Musikproject angeschmissen. The Sacromagic Concept: based on theories of Dane Rudhyar described in his book "The Magic of Tone and the Art of Music". It is the experiment of making spontaneous music by finding a way back to the roots of music and the magic and creative potential of sound. It..s more a live project on basis of music as interaction with people and the special moment in time which can never be reproduced again. So what you can listen to on this site are older projects of my musical career and coproductions with other people. If you really want to be part of a sacromagical concert however, you have to watch out for the next event. As I'm also working as an audio engineer, you will be able to see new recordings appearing on this site. These will represent my efforts to catch a musical event with the aim to conserve it, which stands in contradiction to the sacromagical idea, but is simply one of my great passions. .. Heraus kam 2009 "The Flower Of Life" nach dem 2004 erschienen Vorläuferalbum "Under The Red Sun /Azrael's Child". Na also! 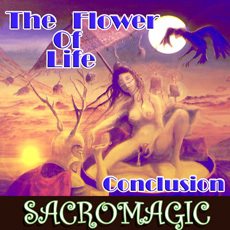 Sacromagic`s PARTII of the Epic album " The Flower Of Life"
Conclusion of the epic album "The Flowert Of Life", which is inspired by the magic year 2012 and the changes that may come soon. Vocal and instrumental parts leading through a world of soul and spirit. Far away from usual song strucures, more like a modern opera. This makes it a unique musical event and forces to listen carefully. Join the world of Sacromagic!